The DUNS number is a nine-digit number, issued by D& B, assigned to each business location in the D& B database, having a unique, separate, and distinct operation for the purpose of identifying them. As a service provider we are responsible according to § 7 para 1 TMG for our own content on these pages according to the general laws. However, according to § § 8 to 10 TMG, we as service providers are not obligated to monitor transmitted or stored foreign information or to investigate circumstances that indicate an illegal activity. Obligations to remove or block the use of information in accordance with the general laws remain unaffected. However, liability in this respect is only possible from the moment of knowledge of a concrete infringement. We will remove this content immediately upon becoming aware of any such violations. Our offer contains links to external websites of third parties, on whose contents we have no influence. Therefore, we cannot accept any liability for these external contents. The respective provider or operator of the pages is always responsible for the contents of the linked pages. The linked pages were checked for possible violations of the law at the time of linking. Illegal contents were not recognizable at the time of linking. However, a permanent control of the content of the linked pages is not reasonable without concrete evidence of a violation of the law. We will immediately remove such links when we become aware of violations. The content and works created by the site operators on these pages are subject to German copyright law. The duplication, processing, distribution and any kind of exploitation outside the limits of copyright law require the written consent of the respective author or creator. Downloads and copies of this site are only permitted for private, non-commercial use. As far as the content on this site has not been created by the operator, the copyrights of third parties are respected. In particular, contents of third parties are marked as such. Should you nevertheless become aware of a copyright infringement, we ask for an appropriate notice. We will immediately remove such content if we become aware of any infringements. In this Block Week at KTU Kaunas, students from KTU Kaunas, Dortmund University of Applied Sciences and Arts and IMC Krems will come together to create concepts and prototypes for VR or AR marketing games. Marketing is one of the most prominent application areas for Augmented and Virtual Reality application. And yet, especially for small enterprises and family businesses, it is very difficult to even judge how such techniques could be applied in their case, as this requires usually in depth technical knowledge. Students will apply their knowledge in their respective field to overcome this barrier and create concepts and early prototypes tailored to the needs and requirements of such companies. As they cover a wide range of disciplines, from Management, Marketing, Project Management to different aspects of Computer Science and Software Engineering, the created concepts and prototypes will reflect this interdisciplinary approach. Besides a technical concept and prototype, the students will also create a project plan, business model, marketing plan, etc. to fit the companies’ needs. This allows the companies to get a first „hands-on“ experience with new technologies and offers the students an interdisciplinary and international learning experience mirroring the needs of later employment. We offer financial support for students of Dortmund University of applied Sciences and Arts to participate in this event. Limited places available! To register for the event, please contact us via this e-mail until 29th March 2019. Tim Torvatn from NTNU Trondheim will be teaching Change Management at FH Dortmund within the study programme for EuroMPM. Change Management is strongly linked to Project Management for projects are often initiated because of a need for changes in an organization. It must not only be checked which kind of changes an organization is willing and able to follow, but also the impact of projects on organizations and all stakeholders, while holding a balance between technical aspects dealing with processes, roles and responsibilities on one hand and the more complex human side on the other hand. The objectives are to enable students to explain concepts of change management and to be able to detect, develop and apply tools and techniques for change management and to develop the competence to analyze and create new ones. For more information on this event, please contact us via this e-mail. Please visit also the official website. The ICIST Conference is hosted by the biggest technical university in the Baltic States – Kaunas University of Technology (Lithuania). 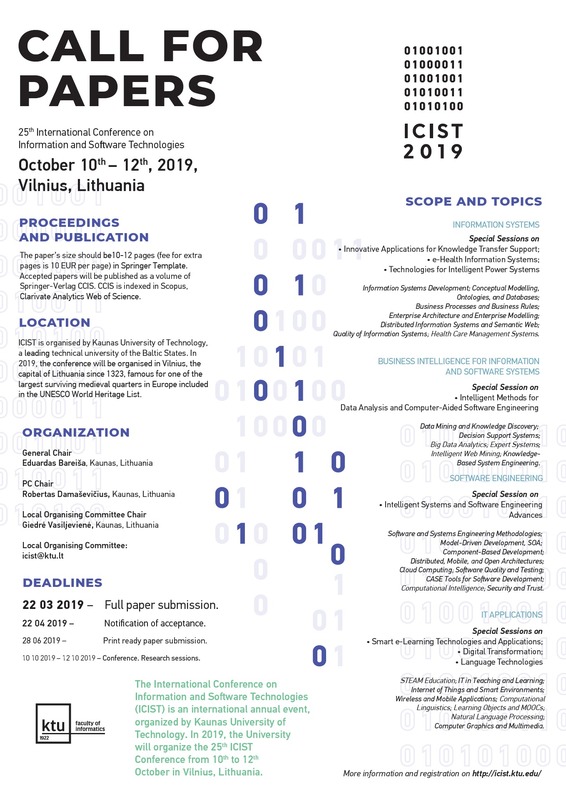 ICIST 2019 aims to bring together researchers, engineers, developers and practitioners from academia and industry working in all major areas and interdisciplinary areas of Information Systems, Business Intelligence, Software Engineering and Information Technology Applications. In 2019 the Conference will be held in Vilnius, on 10th -12th October. For the call for papers click here. More information on the conference here. We offer financial support for members of Dortmund University of applied Sciences and Arts to participate in this conference. For more information, please contact us via this e-mail. The FH Dortmund and the UPV/EHU Bilbao will offer a joint Block Week for the EuroMPM Study Programme on Quality Management on Campus of the UPV/ EHU Bilbao. This block week is the sequel to the block week „Creativity and Information and Knowledge in Project Management“, offered at FH Dortmund in April this year and is directed at students from advanced semesters. Its focus lies on the Sustainability of Projects, mainly from an ecological point of view and its related models to perform Project Management.